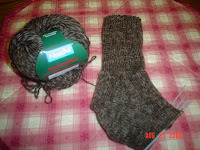 These are the socks I am knitting with some Australian Merino yarn called "Needful". It is lovely to work with -- it works up nicely and feels very soft. The pattern I am using is my "tried and true" favorite pattern leaflet by Ann Norling called Adult Socks II: Play on Ribs in the Wide Wale pattern. It is interesting that although this yarn is called Australian Merino, it is made in Italy!